I finally started on the work I need to get done as prepartion for my classes. I asked a friend with a lot of sewing and costume making experience to help me with taking my measurements and creating a pattern sloper for the design clas with Lily Chin. Along with all the sewing experience, my friend also did some drafting work, along with my extensive sewing experience, we were able to measure and crate slopers for both of us in a few hours. We had plenty of time to drink tea and chat while working, and had a great time. Tonight I will start on the easier assignments, such as swatches and collecting old, interesting patterns. I'm already making lists of materials that I'll need to add to my crochet bag, and lists of crocheted clothing, purses etc that I want to take along. Less than 2 weeks to go! 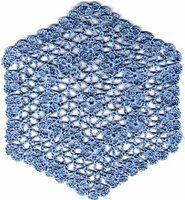 Well, there is a big discussion on the cplist (Crochet Partners)"Crochet Partners" about what to do with doilies. There are a lot of great, creative ideas. Someone sent a link to Sharon Rexroad's website. Sharon makes quilts with cut-up store bought doilies, and lace edging. 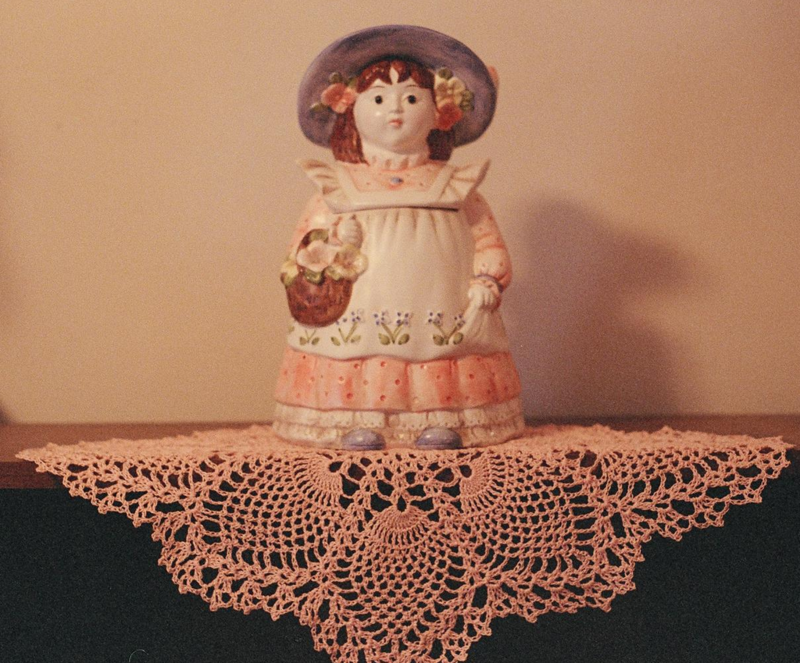 There are links to sources of hand crocheted doilies which are generally priced from 50 cents to $1.50, a few are $3.50. Now, if I'm cutting up 6 or 8 doilies to sew onto a quilt, I imagine I'd only want to pay 50 cents or so for them. But if I'm the one crocheting the doilies, I sure would want to get more than 25 or 50 cents for each! I love this quilt which was inspired by Sharon's books & website "Aruba Ocean doily quilt"
Home & Garden Television did a decorating show with Sharon Rexroad, here is a "how to" for a doily quilted wallhanging. "HGTV how to"
One thing I found was a copy of the instructions for the square that we made in the Overlay Crochet class at CGOA Regional last March. So, while watching tv, I worked on a square out of #10 thread. This is the first 9 rows, picture isn't great because it's a scan, but isn't it working up nicely. It's just 2 inches across! There are a lot of threads hanging from the back, and not a lot of places to work them in. If I can figure out how to finish this nicely, I might add it to my name tag at the convention. I've missed having time to write, time to look for interesting things to share, etc. But the dance studio had their show on Saturday, June 24th. I worked all day, Sat. 17th, Picture day. I did my daughter's usual job, as she's away at college, taking summer classes. The owner's mom took over my job, we're the "office staff". The boss did make like a lot easier on Picture day by setting up a web site where students & parents can view pictures & order their pictures & pay for them right on line. That saved about a 10 inch stack of order forms, checks, receipts, etc. Can't wait till the pictures have been uploaded! I also worked Monday evening, picture day, and Wednesday evening (my usual work night). And I tutor 2 girls on Wed. Around that I crocheted fast and furious to get the afghan finished in time to display at the show, so we could start selling raffle tickets. The show was Sat. evening and I worked the ticket table, the concession stand, and got some time to slip inside and watch some of the dances. My daughter came home Friday afternoon and worked dress rehearsal and backstage for the show. We went out to dinner together Friday after dress rehearsal and Sat night after the show. She had to head back early Sunday morning, so she could study for a Monday morning test. Summer sesssions, they're really tough! The afghan turned out beautiful! After much swatching, I finally decided to join the squares with dark orchid and a modified flat braid joining. Because of this change, I decided that the border needed some changing, too. I used the pale plum and put on a row of sc, ch 1, skip 1; then a row of dc in each sc and each ch. I'm not totally thrilled with the border, I think it needs a little more "punch" to go with the body of the afghan. So, very soon I will frog that last border round and try another idea. Will hopefully get some pictures up very soon. Working on way too many projects, have too many ideas, and homework to do before the conference in King of Prussia. The Alaska Yarn Council is interested in talented Alaska natives. The Anchorage Daily News has been running regular articles about some of these talented folks. This article from Tuesday's paper gives interesting statistics about the number of knitters and crocheters, increase in needleworkers, etc. The article also focuses on a young man from Anchorage who has started his own knitwear design company. "article from the Anchorage Daily News"
Be sure to check out the Nanuq of Alaska website (either through the link in the newspaper article, or by clicking on the green title of this entry), many of those hats are definitely crocheted! There are some beautiful fibers used here. Love the glacier blue, but I think my favorite is the Snow hat and scarf set. It's too bad this article didn't appear sooner, my #1 daughter spent 5 months in Anchorage this past fall and winter. She could have selected some warm crocheted fiber art. She's now in the Denver area for 3 months, who knows where she might be when winter comes again. Well, depending on the contracts, she could be in Anchorage again. If so, I hope she gets a chance to check out some of these products. Monday evening I made 2 chemo hats. The recipient had requested a color to go with blue jeans, so one was baby blue and had a round of crossed doubles near the edge. The other was navy, with the round of crossed doubles in baby blue, and a little ruffle on the edge. They were cute, wish I'd remembered to take a picture. Yesterday I spent time taking pictures of my newest cookie jar acquisition. Made sure to get some doilies in the shots! Camera is not digital, and I have about 18 pictures to the end of the roll, so it'll be awhile before they're posted. Last night was a night out crocheting at Michaels. I showed off the shell doily set, and the Tunisian scarf I made from clearance bin yarn I bought last time. I spent the evening on my toe-up socks. Several people commented on how much I had gotten done. I continued working on the socks while watching a movie (Western) with hubby last night. I guess that I should find time today to take the pictures of feet with half finished socks! I've received my list of classes for the CGOA conference. I'll be heading out to King of Prussia on Tuesday evening, July 11th. This is a fairly short drive, and very familiar. Probably the first time I'll need to look at directions is a reminder of which hotel I'm in! Wednesday I'm set for a full day of CGOA Professional Development, 8:30 to 4:30, with lunch, then a session from 7-9 pm. Thursday I have 2 classes with Kathleen Power Johnson, big name in crochet and a serious instructor. I plan to work hard and learn a lot. The classes are Basic Fashion Design with Tunisian Crochet and Advanced Designing with Tunisian Crochet. Friday morning I've taken a break already. Last year I did over do it, you do need an occasional break, some down time to look at the market, have a cup of coffee and chat with new friends, or maybe work on a relaxing project. Friday afternoon I've got a class with Karen Klemp, looking at old patterns with an eye for how we can adapt them into something new. Friday evening is a dinner, fashion show and silent auction. Sat. I'm taking an all day class on Designing Better Crocheted Fashion Garments. I'm heavy on the designing this year, aren't I? This class is with Lily Chin, I've heard that she's great fun as an instructor and you learn a lot. Sunday morning, Make your Own Crochet Hook! This is with Nancy Nehring. So, what classes didn't I take? Tunisian crochet goes Tubular and Magical Mitered Squares with Darla Fanton, I took a class with her last year, great experience. Overlay Crochet Designer with Melody MacDuffee, I took Melody's Basic Overlay class last year, and really loved it. I havent' been able to create anything of my own, or incorporate the technique into a design, yet. Maybe, this will be on the top of my list for next year. I've found a great pattern for a summer top. Would love to make this for the CGOA conference. That would mean making it after finishing this afghan, dance recital is June 24th, less than 2 weeks. Oh, and before leaving for the conference on July 11th. Maybe if I get it started I could finish it at the hotel during the conference. But I now know better than to plan to spend a lot of time on projects. There are classes, dinners, fashion shows, fiber & book market, people to chat with, homework from classes, new techniques that call you to work on them instead of watching tv in your room, etc. Also, this top calls for a linen yarn, notice that it's $16.95 per skein and the large calls for 7 skeins. I'd want to get 8 or 9 to make an extra large, and not worry about running out, at $16.95 each. I don't think so. Let's spend some time looking at other fibers that might work. And now singing, "Dream on, Dream on". I told you that the local newspaper, The Patriot News was at our Shawl Ministry meeting in April. The article is online, and I read it there, but last night I got to see the actual pages of the paper. My name is mentioned, in identifying a group of women, however, I'm not actually in the picture. At last night's meeting the local news was there, with reporter and camera man. They interviewed the lady who started the Ministry at our church, Derry Presbyterian. They also interviewed a lady who was a recipient of a shawl, who became interested in the group, and decided to pick up a hobby she had loved years ago, crochet. Despite having ms, she's found a tool to hold her work while she uses one hand for her hook, and she's crocheting again. I saw part of the news, (Fox 43 at 10), but didn't see the spot, it was perhaps bumped because a football player was in a motorcycle accident, that seemed to be the big news last night. Someone in one of my many groups was looking for patterns for men, especially afghans and sweaters. 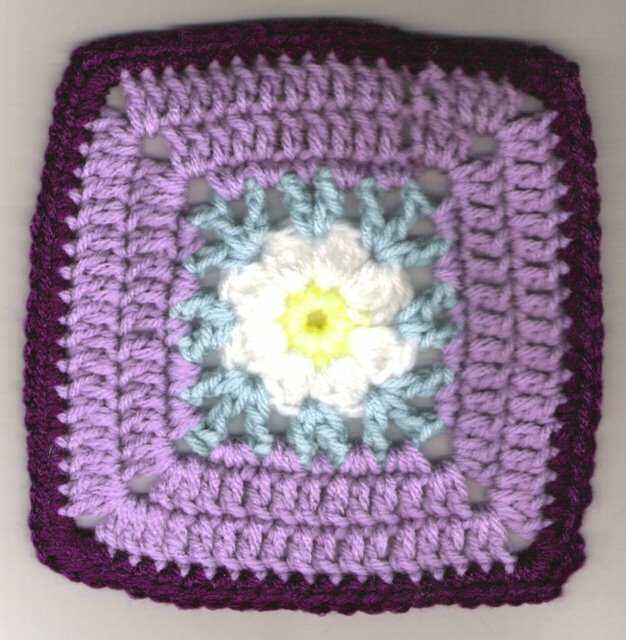 One of the suggestions included a link to a baby afghan on this site, Crochet Garden. Wow! What beautiful work, I spent way too long looking at all the beautiful baby dresses & hats on this site. There are also some great looking hats and scarves. All patterns are for sale, and the creator has written an enticing paragraph for each. This site has something unique, each pattern has a link to pictures of the items made by the pattern testers. This went on to My Favorites very quickly, will plan to come back often. Spend some time drooling over the gorgeous designs at this site. 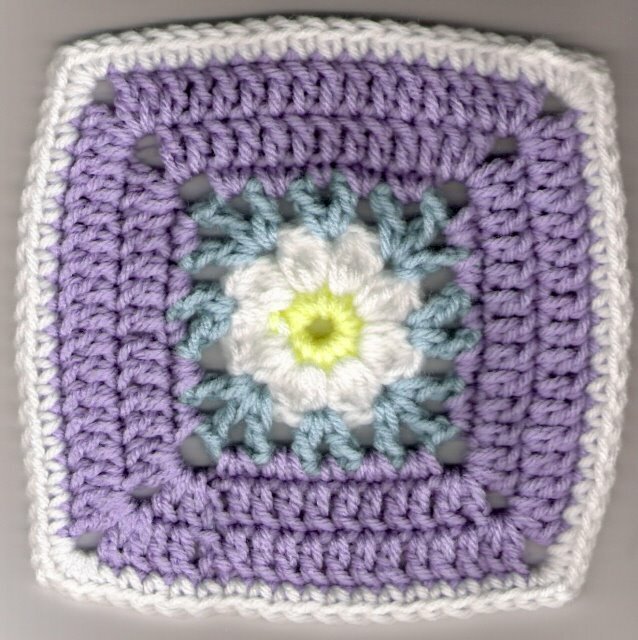 I've been thinking about how I want to join these squares and what color I want to use. I usually just whipstitch the squares together into a strip, then use the whipstitch to join the strips together. But, I've been thinking of using a method that will add some interest and texture to the joining. Yesterday, while reading my many group digests, someone suggested the Flat Braid method, and I thought that might be the way to go with this afghan. So, I was thinking white or the Plum Pudding. The white would go with all the shades of purple, and the white, because I have edges in 4 different purples, white and the Plum Pudding. I thought using the PP might be too much color, you know - a variegated joining on a variegated border. So, I'm trying this joining method with the PP and with white. Just a quick update - Thursday I made 8 squares, Friday 6, and today 3 (I had to run out & buy yarn & help put the mower deck on the tractor!). Anyway, the count is now past 60 which means 3/4 finished with the squares! I'm getting the urge to set aside the yarn and start another doily. Oh, and so many things I'd like to make before going to the CGOA Nationals in July. Work faster, and get this afghan finished. 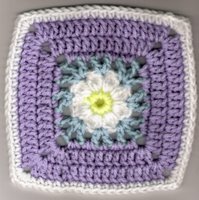 I joined 2 new online crochet groups yesterday, both are mainly related to thread work. The first is "Celt's Vintage Crochet" their motto is "Saving our crochet history one pattern at a time." I definitely want to be a part of that. I spent a lot of time yesterday looking over the site, looking at all the pictures, and reading messages. The second group I joined is "Doily of the Month" I'm eager to spend time seeing what's posted at this group's site. 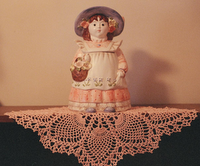 I really love making doilies & looking at them, but don't keep very many around the house. Sometimes I select one to put under a cookie jar that's being displayed. I put out different jars for different seasons or holidays. I also belong to the "Antique Pattern Library" . A few days ago I got an email with the links to the latest books they've scanned and added to the library. One was published in 1883, and is the oldest known instance of using American terminology in patterns. They have some beautiful motifs, want to try making a few from the old patterns. Online groups are a great way to learn about availanble patterns, new books being published, new techniques, a chance to see other peoples' projects, and to make friends. Have I mentioned that I'm not fond of granny squares? All the stopping and starting, all the joins, the ends to work in, and then joining the squares. I really prefer a one-piece afghan. But I'm up to #35 of the 80 squares. I've been experimenting to find a nice join for these squares. And here's what I've worked out. After completing the last stitch of the round, cut the yarn leaving 4 to 6 inches for working in the end securely. Insert hook into the back loop only of the first stitch of the round, yarn over and pull through that loop and the loop on your hook, pull the end completely through. Then insert your hook into the front loop of the first stitch, catch the yarn and pull through the front loop. Insert your hook from back to front between the first and second stitch of the round, catch the yarn and pull it through to the back of your work. Now, you can work in the end as you normally would. I prefer to use my crochet hook, and not a yarn needle, but I know that a lot of crocheters use a needle. Here's a picture of one of the squares I've finished. Do you like the join? The colors are not true to life. The first is pale plum, the second orchid and dark orchid. I've gotten a very good start on the third of a series. Each year I'm crocheting an afghan that is raffled off to benefit the dance studio where I work part time. 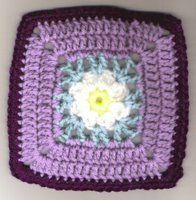 The studio has a saying "It's all about the purple", and the first afghan was a ripple with a border of large hexagons with daisies. It was a great hit. Last year I selected a more difficult pattern, softer yarn, but made it all in amethyst. It was beautiful, but didn't grab the attention as well. 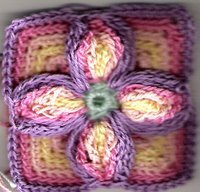 So this year's afghan is made of granny squares with big flowers, I'm using plums and orchids. Want a peek at the colors? Well, last night I was feeling much better about this doily. I was all the way up to negative 1/3 rounds! Went to bed knowing that this morning I could get into some positive numbers. And for the last couple days, I've been thinking about a variation, taking 2 of these and making them into something besides a doily. A beautiful accessory. So I get to the end of round 12, again! I've reached Zero and ready for positive numbers....and the last part of the round doesn't meet the beginning of the round. Huh?? Don't think I've ever had that happen with a doily. So, I frog again, back to round 8. And find the mistake, I started round 8, 1 triangle in from where I should have. 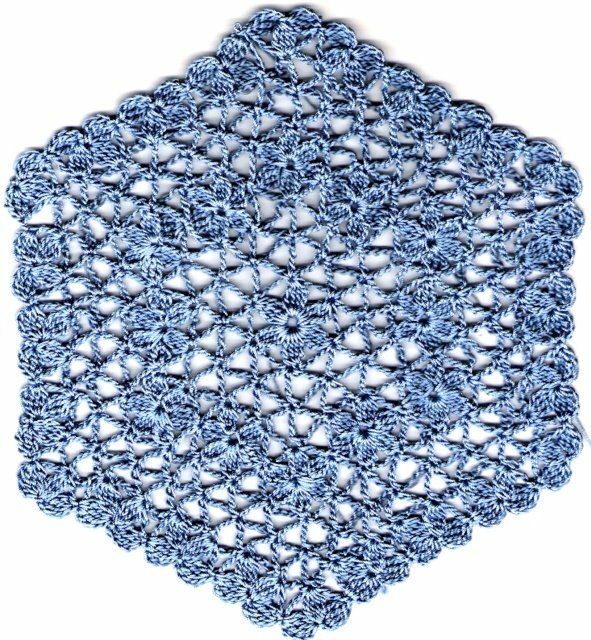 So, I think this doily, very pretty at round 8 will become that accessory, and I'll start fresh on the full doily. That, however, will have to wait until I finish this afghan. Here's the progress on the Jasmine Doily. A reporter and photographer from the Harrisburg Patriot News came to the Shawl Ministry meeting in April, and the article was in the May 29th paper. Just got an e-mail from the coordinator or our Shawl Ministry with all the great interest the article has generated. The local TV news may be at the June meeting. People are interested in information on starting their own group, finding patterns and visiting our group. Once more, our group may be expanding their focus. There is interest in making a shawl/lap robe/ dorm blanket for each graduating senior at the church. That should keep us even busier than shawls for each of the babies baptized. I guess I better get the hooks moving faster! Here is the website that has the Chemo caps that we're making, click on the link for products. "Lessons in Hope"
Yesterday I met my friend Faith and her daughter at Michaels & then we went next door to Border's. We got iced coffees (Kahlua Mudslide Freeze) and crocheted for about 3 hours. I spent some time looking at new crochet and knit magazines. I saw 1 or 2 things of interest, but not enough to pay $8 for a magazine. Crochet! has plenty of interesting patterns in each issue. I worked on my Jasmine doily in Delta crochet. I haven't been happy with the way the side blossoms look on this doily. I don't remember having problems with the blossoms in the other projects, so decided to review several lessons. I found my problem - a bad effect from good progress. I worked very hard to learn how to work from the charts, and I've mastered it well enough that I was working only from the diagrams, no words, on this doily. But I was misplacing-placing a single crochet that was supposed to come after the 3rd petal, I had it between the 2nd and 3rd, which left a gap between those petals. I went back to the lesson on the side blossoms (lesson 2) found the misplacing-placed chain. I then decided that it was bugging me enough that I had to go back to the last round before the blossoms and re-work. So after 3 hours at Borders and another hour or so at home, my progress on the doily was night stood at Negative 6 rounds! I worked a little on this today, and I've gotten to -4 rounds. I realized what I want to use to help with designing in Delta. I just happen to have some in my supplies, too. Hexagonal graph paper!! I know, no one else just happens to have hexagonal graph paper at their house. But, I teach mathematics, including a fun class on recreational math, and hexagonal graph paper happens to be the best thing to create Pascal's triangles. So this weekend's fun will involve hexagonal graph paper, colored pencils and crochet designing!